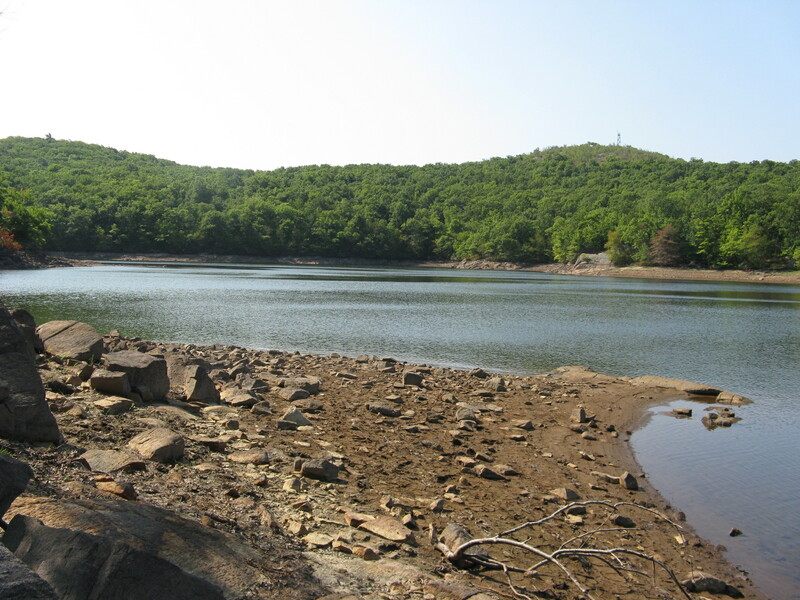 A Stage I Drought Alert is issued when the system’s reservoirs are at 60 percent of capacity. The reservoir on Mt. 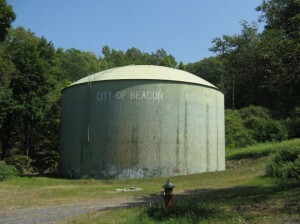 Beacon, shown in these photos from September 7th, is one of three that supply the city. The other two are the Cargill and Melzingah reservoirs. The Mt. Beacon reservoir is located in Fishkill. 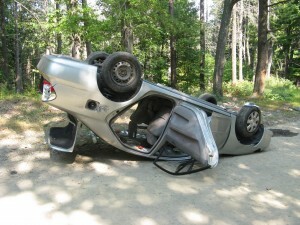 The Cargill is off East Mountain Road in Cold Spring and the Melzingah is near Breakneck Ridge. 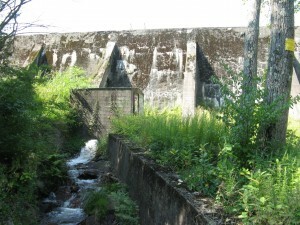 The water from the three reservoirs is blended with additional water from three ground wells according to levels and need at the water filtration facility on Liberty Street. 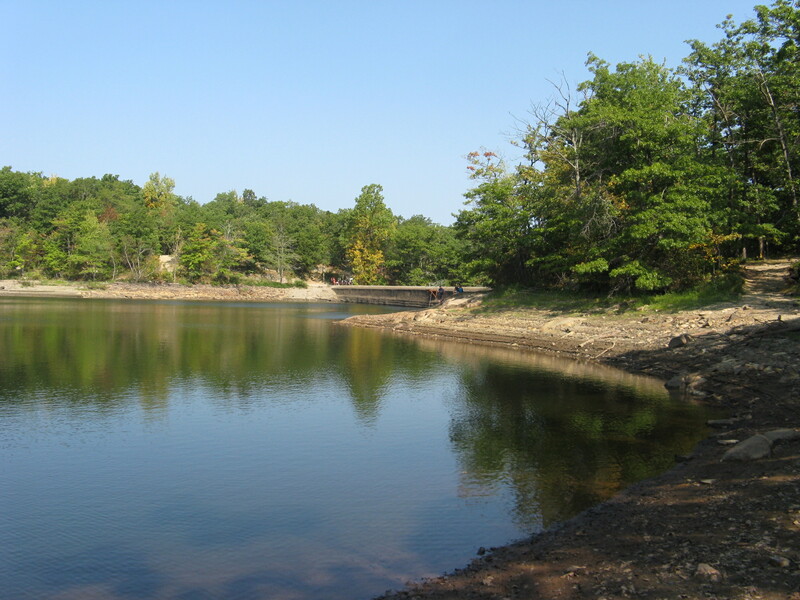 In 2014, the city used an average of just under 2.5 million gallons of water per day. If capacity falls to 40 percent, or one of the wells goes out of service, a Stage II Drought Alert is issued. The Stage I “suggestions” are the basic ones most citizens are familiar with, including not washing cars with a hose but using a car wash instead; not watering lawns (although it is permitted during certain hours); not hosing down sidewalks, driveways, etc. 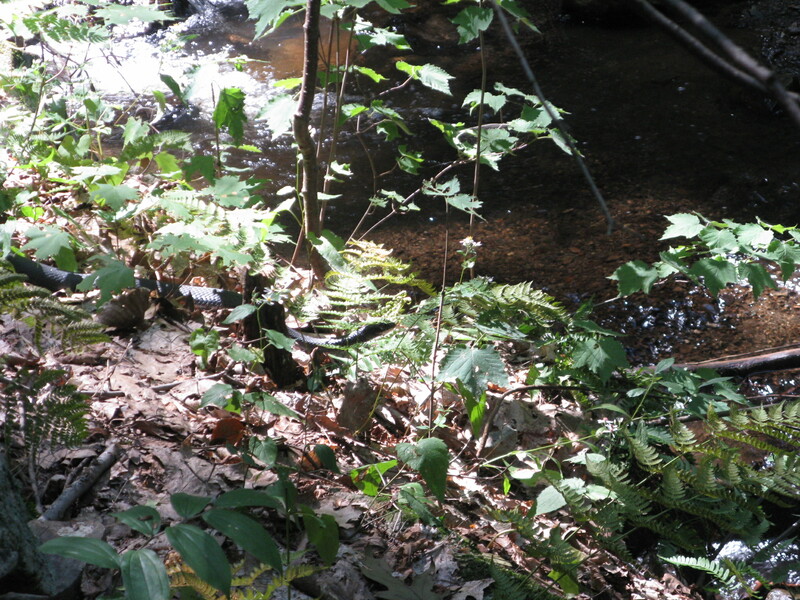 ; not using water ornamentally, ie, in fountains, artificial ponds, waterfalls, etc. ; fixing leaks. Beacon, unlike a full-on suburban community, is not a place that overly fixates on luxurious lawns. It’s not like before the drought was declared thousands of lawn sprinklers were whirring away each day. Judging from the number of browned lawns, most people are adhering to the don’t water your lawn request. The wash-your-car-in-the-driveway habit also is not a huge Beacon tradition, so it is unclear where any dramatic decrease in our daily consumption of 2.5 million gallons will come from—more likely the alert is just to bring the issue to people’s attention. A snake enjoys the water heading downstream. City of Beacon water may be used to water any lawn, tree, shrub, garden or golf course, greens and tees only from 7:00 p.m. to 8:00 p.m. and 10:00 p.m. to 11:00 p.m.
 City of Beacon water may be used at any time to irrigate, from a hand-held container, vegetables or fruits for human consumption. So, you can still use a sprinkler system to keep the links lush, but if you are growing edible greens, be prepared to hydrate lovingly by hand. 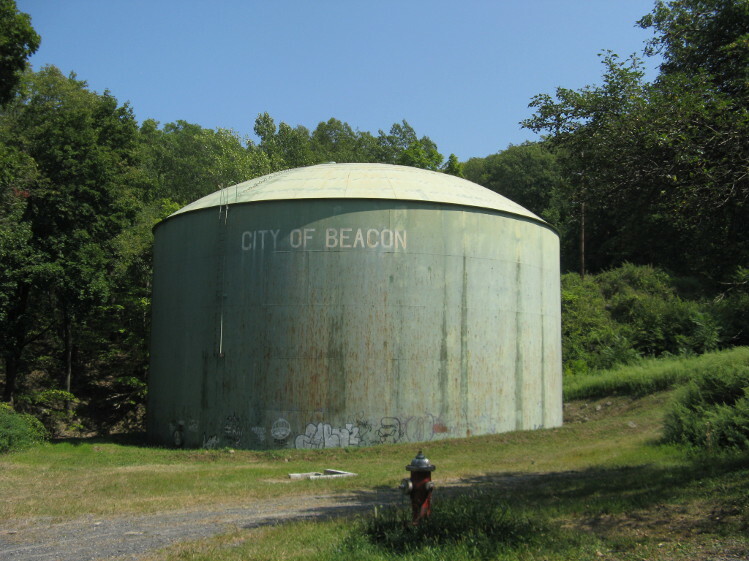 Each nonresidential user of water from the City of Beacon water system shall prepare and retain a water consumption reduction plan enabling it to reduce its use of water in stages of 15%, 20% and 25% based upon its water consumption during the calendar year. Such plans shall be designed to achieve and maintain a reduction of 15%, 20% or 25% immediately upon the declaration of a Stage I, Stage II or Stage III emergency, respectively. Each such user shall promptly implement the first phase of its plan during Stage I and shall reduce its consumption by 15%. On and after 30 days from the effective date of this chapter, each such user shall have its water consumption reduction plan available at all times for inspecting and copying by employees of the Department. Obviously, unless conditions get markedly more dire, the city is not going to enforce this code. How much will it help if Zora Dora cuts popsicle production by 15 percent? All that will do is aggravate tourists who stop by later in the day. With a good snowy winter being predicted for the Hudson Valley by Farmer’s Almanac, it could very well be that things will be more or less back to normal by spring, water-wise. Lets hope so, since it appears we don’t really have an effective means of cutting our overall 2.5 million gallons a day water consumption at the moment. Littering is still a problem on Mt. Beacon. Unfortunately, unlike water, money does not fall from the sky. Nor does it grow on trees. In our complex economic system, humans at this point have about as much control over what happens to it as we have say in how much rain comes down. When the 30-year credit bubble finally pops and we tailspin into a deflationary spiral, it’s likely we will pay a bit more attention to a Stage I Money Shortage. And we’ll have more vegetable plots and less lawn to water. As long as the sprinklers are on during the specified timeframes, they are allowed to water. In any case, the City will not do anything. Even though the administration has invoked the alert, and the code is very clear on what this entails, the city administrator’s language makes it equally clear that they will not be enforcing to the letter of the law at this stage. Nope, it was the middle of the day.